Given the frequent references I make to classic adventure strips like Terry and the Pirates that served as inspiration for Rob Hanes Adventures, I've been remiss in not mentioning here the iconic adventure series, Tintin. Though not as well known domestically in the U.S., Tintin is an icon everywhere else in the world. 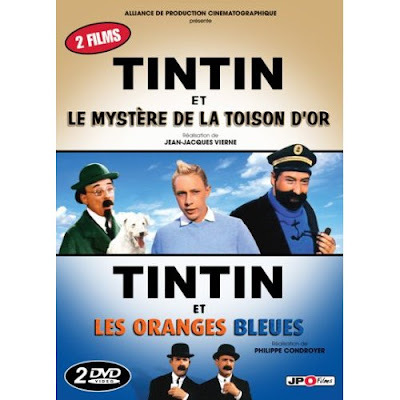 The series is the brainchild of Herge (the pen name of Belgian cartoonist Georges Remi) and features the globetrotting adventures of Tintin. (Though identified as a reporter in the series, in a conceit that's typical of many adventure characters, readers rarely ever see the hero actually practicing his chosen trade.) Tintin is usually accompanied on his adventures by his faithful dog Snowy (Milou in the original French) and a hard-drinking seaman, Captain Haddock. 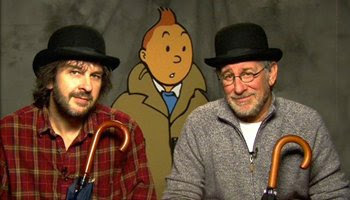 Over the years, the series developed a strong, well-defined cast of supporting characters such as the bumbling twin detectives, Thompson and Thomson (Dupont et Dupond). Examples of the high regard in which the series is held can be found in a chain of upscale retail boutiques devoted to Tintin and other European characters that I've blogged about in the past, Karikter, and several fine books and biographies such as Tintin and the World of Herge by Benoit Peeters. 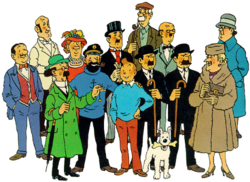 Tintin was created within Europe's rich comics tradition that developed somewhat separate from and parallel to U.S. comics. Debuting in 1929—the same year as Buck Rogers and Tarzan, the two strips that most historians agree signaled the start of the adventure comic strip—Tintin began as a serialized feature in a children's supplement to a Catholic Belgian newspaper based in Brussels. The strip quickly became a European and international sensation, its place in history no doubt secured by the fact that each of the completed stories were regularly collected as complete albums sold throughout the world. As noted in its Wikipedia entry, "the series is one of the most popular European comics of the 20th century, with translations published in over 50 languages and more than 200 million copies of the books sold to date." As one can see from the samples included in this commentary, Herge was a disciple of the ligne claire ("clear line") style of drawing, where the artist drew in a very clean style where everything was very clearly delineated, leaving very little room for the artist to fudge. The series was greatly admired for being well researched and topical, no doubt an outgrowth of this style of cartooning and Herge's own sense of perfection. Always good natured and moral, as well as appropriate for all ages, the series conveys a world of exciting adventure for young readers. I can't say that Tintin served as an early inspiration for Rob Hanes Adventures. Though I became aware of the character as a child through animated adaptations that found its way to American television during the 1970s (my memory is that they were fairly faithful to the source material), I did not begin really purchasing and reading the books until well into adulthood. But over the years, I have come to very much appreciate the series, partly through the retail store and books mentioned above. I must also admit that, due to the painstaking attention to detail, the books have become a helpful reference! Now is a good time to mention the series because this year marks the 80th anniversary of the character. Of greater interest, however, is the fact that a $130 million film adaptation of the character is now in production! For those who haven't heard, the film is a unique joint project between directors Steven Spielberg and Peter Jackson (a recent Los Angeles Times article about the project is available here). The films have been projected as a trilogy with Spielberg directing the first film and Jackson directing the second. However, the movies appear to be much more collaborative than that: Spielberg has completed principal photography on the first film using motion capture technology and Jackson will reportedly spend the next 18 months overseeing the CGI phase of the production at his Weta special effects house. Initially, the filmmakers had trouble raising the funds for the film, which was partly a function of the downturn in the economy as well as the concern over whether the film would do well domestically given how little know the series here is in the U.S. But the film, licensed by Spielberg since the '80s, is clearly on track. Below: I presume the Spielberg/Jackson production won't look like the adaptation below! I was just out of college when Alan Moore and Dave Gibbons' 12 issue Watchmen limited series was released in their original comic-book format in 1986 and 1987. I bought and read the entire series (I'm sure the comics are buried somewhere among my boxes of comics), but I have very little memory of it. (On my bookshelf, I have a copy of an unpublished script from the late 1980s that was an early attempt to adapt the series). While intellectually I knew it was a monumental achievement, it's not a work for which I felt any particular personal affinity. As a result, I must admit I wasn't feeling particularly compelled to see the movie; in fact, I likely wouldn't have if not for the fact that several longtime college buddies and I who share the same geek ethos have lately made it a tradition to make it a "guys night out" to see films like these together. Simply put, I think this is a terrific film. I give director Zack Snyder and the screenwriters full credit for finding the "through-line" and soul of the story, and putting it to screen without feeling like something was left out. This is a film that stands on its own, and that anyone who has not read the book could enjoy and follow. And as faithful an adaptation this film is (some have called it "slavish"), Watchmen does more than simply superficially re-create the look of the original series. Watchmen successfully understands and captures the soul of the story: it is full of heart and, though not as strongly as Moore's original story, presents the same ambiguous arguments about the price of "heroism" and salvation. 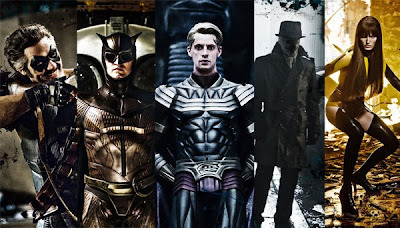 The actors—particularly Jack Earle Haley as Rorschach and Jeffrey Dean Morgan as the Comedian—deserve the critical recognition theyhave received for their performances. Another actor worth mentioning is Patrick Wilson's as the Nite Owl for a quieter performance that grounds the film on a human scale. I've never been a fan of films that are explicitly violent. And while I would have preferred the movie to be a less graphic, it nevertheless was in keeping with the tone of both the film and the book, and never took me out of the film. It seems safe to say at this date that Watchmen is a financial disappointment. As well done as this movie is, I can understand why Watchmen might be an acquired taste with limited appeal. As one of my friends who saw it with me noted, it might be too early in the current trend of comic-book based movies to present to general audiences a superhero film as morally ambiguous as Watchmen that attempts to subvert the genre and use it for bigger ideas. It doesn't help, too, that Warner Brothers marketed the film as a "must see" event without trying to fully explain the premise of the story to a wider audience who might not be familiar with the work. Whether or not better marketing would have helped the movie is debatable. The filmmakers should be proud of what they have achieved. It's been awhile since my last post—I was hoping by now to have new pages posted from Rob Hanes Adventures #12 which is currently in progress, but decided to hold off a bit longer until I have completed postproduction on a few more pages. It looks like they've been around awhile, but I stumbled across these while playing YouTube videos for my children on my iPhone. I haven't been able to find proper credits, but they are a series of videos featuring someone singing lyrics set to classic popcorn movie theme songs. Below are what I thought were the funniest and cleverest: Superman and Star Wars. If you click through to YouTube, you'll find many other video parody homages to Back to the Future, Batman, Jaws, and others.